I’m back on Route 66 in the Mojave Desert. Call it Phase 2 in my attempt to walk from coast-to-coast. The Journey so far: I began at the Pacific Ocean in Huntington Beach, California, on April 17, 2017. After walking past Amboy, I became a “victim” of a Heat Dome that descended on the Southwest. As I was quickly succumbing to the effects of the extreme desert heat, I was rescued by friends who drove me to Kingman, Arizona. I spent two nights in Kingman recovering, and then continued my journey east, walking to Flagstaff, where my plans hit a snag. I’d originally planned to head north toward Colorado, but because of threats of snowstorms (which were even worse than anticipated), I instead took a bus directly south to Phoenix, where I proceeded to walk to Duncan, Arizona, located near the Arizona-New Mexico border. Sadly, the heat never let up. The heat dome lasted for weeks, as the heat of the day remained trapped in the area even after the sun would go down. The danger is in the prolonged nature of the heat event. Temperatures in Phoenix in May and June, 2017, reached as high as 119°. After walking 600 miles, I discontinued my journey. I do not have a Death Wish, so I decided to live to play another day. The “other day” is today. When he heard that I’d planned to resume my walk, my son Adam (with the encouragement and blessing of his wonderful wife, Kelly, and my exceptional and talented grandson, Maxwell), asked if he could be of assistance. I gratefully accepted his help. Our plan is to have Adam drop me off in the morning and pick me up after my day of walking (during the month of February). It’s great spending time with him. 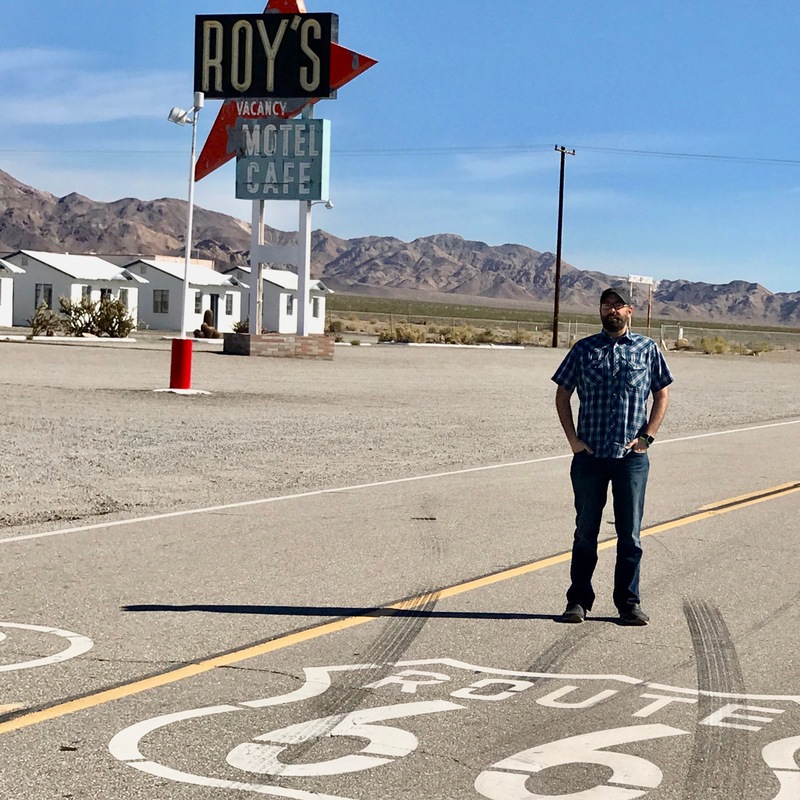 Today I walked on Old Route 66 (a.k.a. National Trails Highway) from Cadiz Road to a location several miles short of Essex Road, a distance of approximately 18 miles. It was not too hot, and there was virtually no traffic—that section of Route 66 is closed to traffic due to construction. I met two “angels” along the way—the UPS guy who offered me water and Gatorade, and Jennie, an environmental monitor working on a local drilling construction site, who gave me a lift in her truck to the pick-up point on Essex Road where Adam soon found me. We’re staying in Needles, California for a few nights as I make up the 100 miles I didn’t walk last spring. It was almost a pleasure walking on Route 66 today—reasonable temperature, no traffic, and an occasional mild breeze. I doubt these conditions will last; my only complaints are sore feet and back.